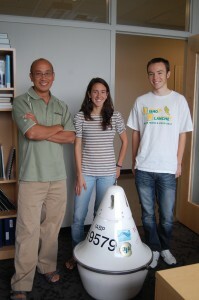 Ignatius Rigor, Principal Investigator, with UW graduate student, Melinda Webster, and undergrad student, David Bruce-Rennick. The primary components of educational outreach within the Polar Science Center are undergrad and graduate student involvement with specific research projects and various community outreach events led by PSC investigators. If you are an undergraduate or graduate student interested in learning more about potential research opportunities, click here.